Yes it has been a while again, but I am enjoying a much needed break from work right now. 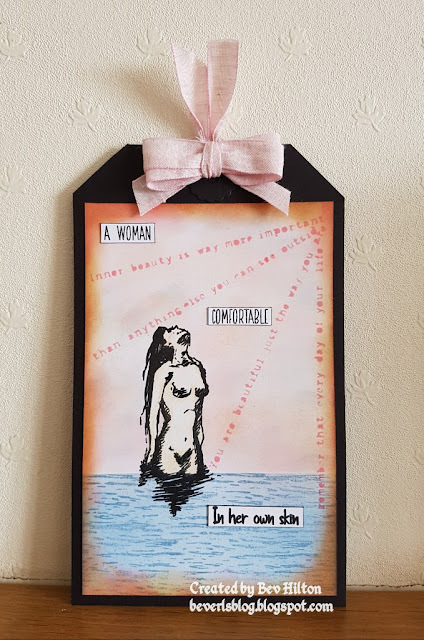 The week is whizzing by way too fast but I have managed a little play in the craft room. Sebastian again. He has escaped the acrylic piece I last made. Seth Apter Stamp set... 3180-LG Mark Makers. Versafine Ink... Onyx Black and Imperial Purple. Archival Ink... Watering Can and Garden Patina. Ranger Distress Inks... Cracked Pistachio, Peacock Feathers, Seedless Preserves and Dusty Concord. Creative Expressions Cosmic Shimmer Embossing Powder... Brilliant Sparkle Clear Mirage. Nuvo Crystal Drops... Ivory Seashell. I began by blending over the distress inks, keeping the seedless preserve to the edges. Once happy, blend the dusty concord around the very edge just to darken it slightly. Give the tag a quick spritze with water and blot with a paper towel. Take the octopus and ink up with the watering can. Being a grey it will give the look of being in the background slightly and allow my main image to pop. Take the versafine ink and stamp the seahorse, do the same with the verse. Colour the octopus with pencils. Take the posca pen and add highlights to the eyes on both the seahorse and octopus. Also add white dots to the body of the seahorse. Take the netting stamp and using imperial purple, stamp parts of it at random around the tag. Take the lines element from the Mark Makers and stamp randomly with garden patina. I felt a little delicate sparkle was needed. 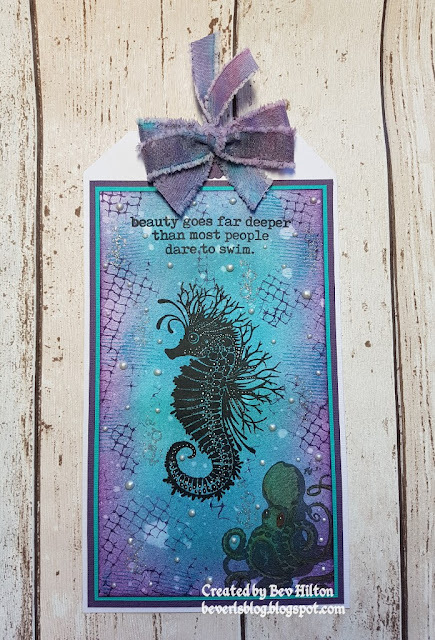 Using the bubbles element from the Visible Image stamp set and the perfect medium, stamp at random and then sprinkle over the embossing powder and heat. Take the Nuvo drops and dot randomly over the tag making sure they are all different sizes. Mount onto matching card stock and then onto white card base. Take the peacock feathers and seedless preserves and press onto a craft sheet, spritze with water and run a piece of white ribbon through to pick up the colour. Dry with a heat gun. Punch a hole in the top of the tag, die cut two hole reinforcements and glue in place. Cut a piece of ribbon and push through the hole and then tie a ribbon with the remainder and glue to the top of the tag. I like to use a hot glue gun for this. I hope you like it and thanks for dropping in. Hope to be back very soon. Hello dear Bev, lovely to see you here again- and wonderful for you with a week off - I`m sure you needed it my friend. I love your tag , and love the Lavinia stamps - wonderful colors used, and the quote so sweet.